There are some projects that just get me deep inside. Whenever designing a space, we think of all of the functions the room needs to have. In this case- it was my dad's lakehouse bathroom and it needed to be practical and be able to handle lots of wear & tear from guests. But beyond the functional, I always want something more. This cottage has been in my family since the 50s. We've been been making memories here through now 4 generations. I remember coming here as a little girl and the whole family piling into the cottage on summer weekends: Beds pushed together, laughing & talking late into the night to the hum of the window air conditioning units. This cottage was built in the 1930s and when my dad inherited it in the late 90s, he completely redid it. I've been there helping along the way & we've had our disagreements believe me, but most of the time, I win. I want to share with you one of my favorite finished spaces, the kids' bathroom. We started with nothing. There wasn't an original bathroom there, jusgt a small sitting room. My dad raised the roof on the original cottage and made room for a large bathroom. When I started on this space it was just rough- framing, sans-drywall. There are details that my dad has filled in that were not the ones specified by me (such as the wall color, chrome outlet covers, etc.) but I am seriously trying to LET GO. (It's not easy for someone like me..) I got to this bathroom in spurts on visits and so it's not exactly as I want it but it feels good, which is what matters most to me. I used fun bright colors- corals and aqua- to pull in the glass floor tiles and the scheme from the kids' bedroom. The kids piled into the clawfoot tub!! (It's not original to the house, but a new 7 footer.) It was exactly as I'd envisioned and was seriously awesome. I'm sure many of you feel the same way about creating a space: you envision the way things will play out and "making memories" in the perfect setting. We'd had a nice long day at the lake and then it was easy & fun to just run the bath water in the massive tub and pile them in at the end of the day. i loved seeing them having such a blast. This is what it's all about and I just wanted to share with you. When we're creating rooms we really are doing more than designing spaces. We're affecting how we'll live. I love it!! what a charming bathroom! i love the tub. but hands down the cutest part are the kiddos! I love this! We are renovating our own lakehouse bathroom. What is the paint color on the wall? You brought tears to my eyes. Yes, this is exactly what's it all about. It's a beautiful space, to top it all. I love it! Orange and aqua-y blue is one of my favorite combos! Love the tub and those precious nuggets in it! I can totally dig it. We have a place where we come every year that is near our own lake and I just love the continuity of the trip. I strongly feel that if you make memories there with the children the kids will come back as adults and will cherish the space just as strongly as you did. Family is so important! j'adore the turquoise and coral! Those little tow heads remind me of my own, I wish I had a clawfoot tub to take pictures of mine! Just out of curiosity, what color would you have painted the wall?? Oh and that lobster print...FANTASTIC! oh and where did you source that sink? So precious!! A 7' tub? That is awesome. Ours is only the 5 footer and I still pile my 3 in there... so sweet. ...and you are creating good clean fun in one fell swoop! Just posted a box to you today with a book that I think you will find stylish and right up your design alley! Adorable! The kids AND the bathroom! Lauren -- true summer lovin! What a great memory, and I love how the hand and foot stamps coordinate with the towels!! Lauren, that tub is to die for, love the prints, love the little framed hands and feet, love EVERYTHING! But the kids in the tub just melted my heart. Such a pretty, fun bathroom. I'm curious to know what colour you would have recommended for the walls. We have almost the same colour floor tiles and I'm wondering what goes with it. I could see a framed copy of that photo of those 3 smiling faces hung in the bathroom. Great photos and beautiful children! Love the stamps of the hands and feet - too cute! In the end, it's the memories that are created in the space not just the space itself. Sometimes it's hard for designers to grasp...we're always thinking of what could be changed or what could be better. But, looks like those kiddos are as good as it gets! What a sweet space!!! Love it! Gorgeous! Honestly, I couldn't pay attention to the beauty of the tub because I was so distracted by the absolutely adorable children!!!!! I LOVE the turquoise and coral accent~Great Job! It's adorable. Can you tell us all where the sink came from?? Beautiful! Love the blue tile floor and the touches of orange. And that tub is FANTASTIC. Perfect for your darling little ones. Congratulations on living your dream. I do love the pops of orange, too - so fresh! ... and the kiddos are adorable! I love this clawfoot tub! I am a new follower and LOVE your blog... thanks for the daily inspiration! So beautiful! The bathroom and the sentiment! and the Kids!! too cute! 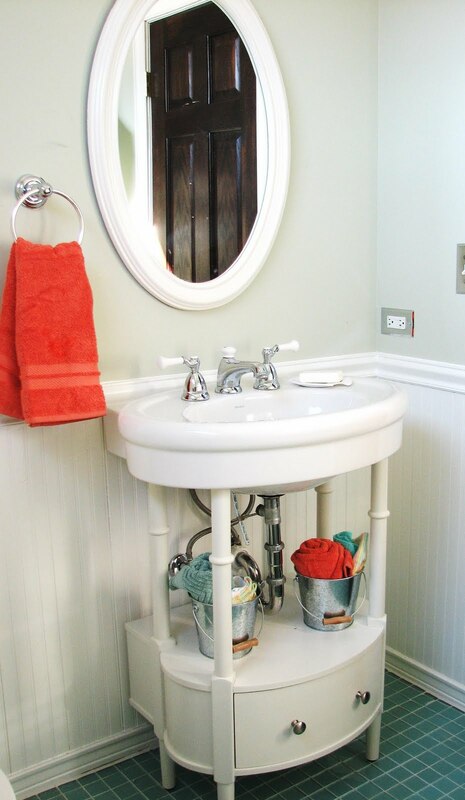 Love the vanity, the tub, the walls, the picture, awwww, the whole darn thing!! Great job! I know exactly what you mean about making memories, and this is the perfect place to make new ones now! love the tub, I have always dreamed of having a claw foot tub in my house! It's lovely, I hope you got to soak in the tub too ! Those kids are uber cute!!! The bathroom looks awesome by the way, great job! It all looks great....but the smiles on the kiddos faces says it all!!! Great job and enjoy the vacation. I came across your blog via Kerrisdale Design and have really enjoyed it! I LOVE THE LITTLE CUTIES IN THE TUB! Kiss Christian and Justin for me. So sweet! Love the artwork. It looks wonderful Lauren and the kids smiles say it all. Just look at them and see how happy they are. They don't care that the walls aren't the perfect shade and I think that the important thing here is that you and your dad did it together! What a wonderful way to honour the memories created by the generations! Thanks for sharing. I love what you guys did. Lauren, you have done an amazing job throughout your dad's house. I was just up there a few weeks ago for some boating on the lake and your dad let me take a peek at the progress. Each room is breathtaking!! These memories sound so amazing. I bet it was fun to update a space you had so much memories with. love it Lauren...thats what it is all about - living! You did a fantastic job, loving it. that clawfoot tub is a dream of mine too, gorgeous work. I wouldnt worry too much about the paint color....the lobster print ties it all together. It would be cute to take the photo of the 3 kids and turn it into a canvas and hang it in the room to create personal artwork since it is a family home. Great post. Beautiful post! Those little darlings in the tub are having a blast! It is so lovely and very inspirational with its simplicity and soothing colors. Thank you for sharing it. Adorable! What a great memory. You should frame that picture of the kids on the tub. I always hang pictures of kids in the bathroom in a single photo right about the toilet paper holder. I know sounds funny but it always makes people chuckle. I once got my girlfriends son on the toilet and asked him to hold a newspaper...I took the photo and hung it in my bathroom for years. What a cute little space. Love the personal touches. Ann at Peggy Fritz. a wonderful post!!! you got the right balance. I am somehow just finding your blog! Fab pics Lauren, I just want to check - did you receive the PDF of the blog watch article I did? Sent it about a week ago. So cute - love the clawfoot tub. I absolutely love family cottages - I'm really hoping we will have one of our own someday - such a great way to make lots of memories. Love it Lauren! you zit post is hysterical! glad to know it works, in a pinch I use good old crest toothpaste and look like you! Your bathroom is beautiful, and your kids are so cute! Window treatments would greatly add to a bathroom as well-done as this. I came across your post this afternoon while browsing interior design blogs and the topic of window treatment selection was very interesting to me. It is true that you must dress your windows appropriately to bring out their true beauty. Thank you for writing and as a special thanks to you and your readers, I would like to offer a 20% off coupon using this code upon checkout: BLG20.